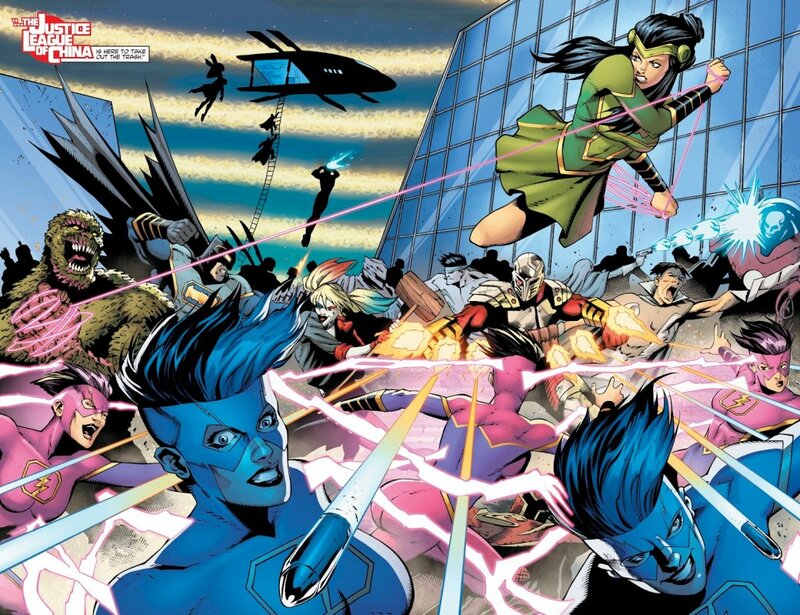 Chinese Justice League: a cheap clone or logical DC universe expansion? DC’s New Super-Man comic series had recently gone through a name change: now it is named New Super-Man and the Justice League of China. But who exactly are the Chinese superheroes and why DC decided to devote the whole comic series to them? Keep reading to find out. In 2016 during DC Rebirth campaign DC Comics launched a new comic series entitled New Super-Man. It is written by Chinese-American author Gene Luen Yang and illustrated by Viktor Bogdanovic and Richard Friend.This is a stand-alone comic that wasn’t involved in any crossovers or huge events in the DC universe. 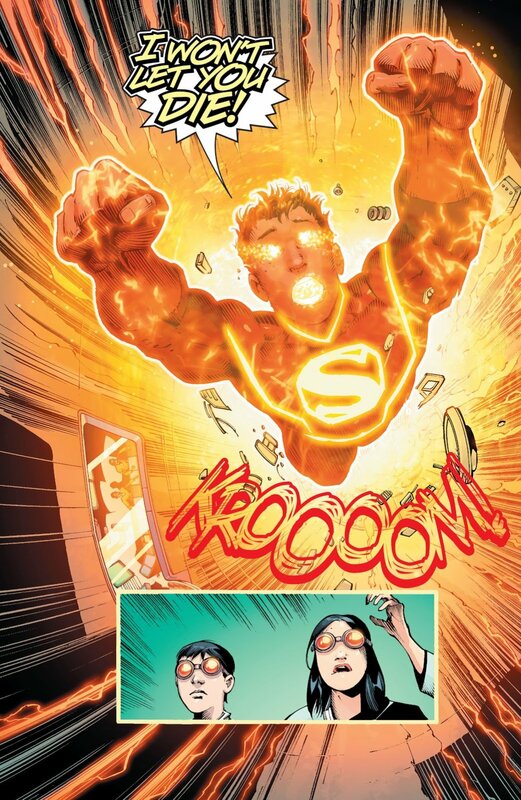 Still, we get to meet Chinese Super-Man in Action Comics as well as in Superman series. 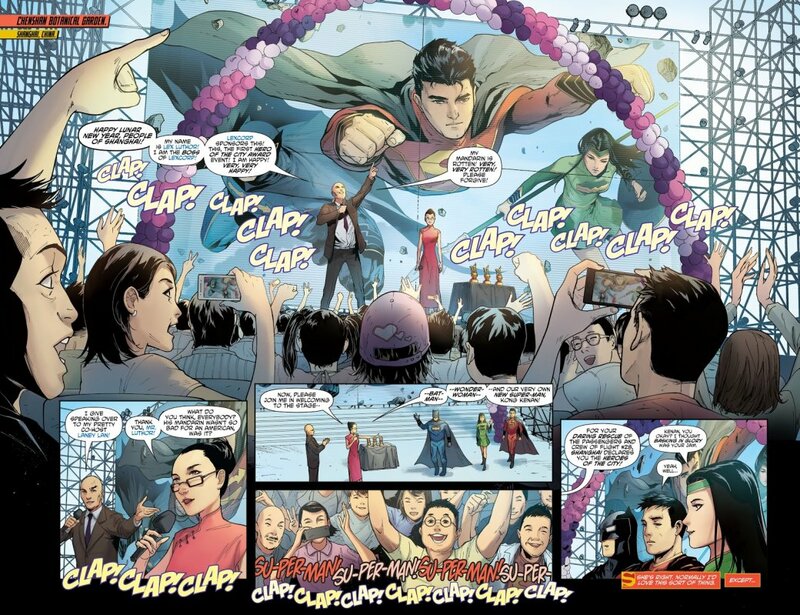 New Super-Man is a story of an attempt to create a Chinese Justice League that later turns into a serious rivalry between old and new Chinese superheroes. The series have cameos by American superheroes and villains – e.g., Lex Luthor, Suicide Squad, Justice League and Superman. But their appearances are strictly occasional because the main story revolves around the eponymous Super-Man. Kenan Kong was just a simple Chinese guy (with a Japanese name, by the way). We do no know much about his family besides that his father worked as a mechanic and his mother died in a plane accident when Kenan was 12. He did not receive much attention from his parents, so he grew to be quite a troublemaker, albeit a brave one. Once when he tried to rob his classmate he got attacked by a supervillain. With just a soda can Kenan managed to destroy the villain’s costume. This event made the news — thanks to Laney Lan, the reporter from Primetime Shanghai. Soon the whole country was aware of Kong’s heroic deed. It just so happened that China’s Ministry of Self-Reliance heard the news too, and – what a surprise! – they just started working on creation of their own Superman. That’s how Kenan got into the secret program and later on got irradiated with solar energy. Kong got the Superman’s powers — but not all of them at once. The first abilities he obtained were invincibility and super-strength. As the story develops, Kenan becomes more powerful: he learns to fly, to use his heat vision and freezing breath and so on. 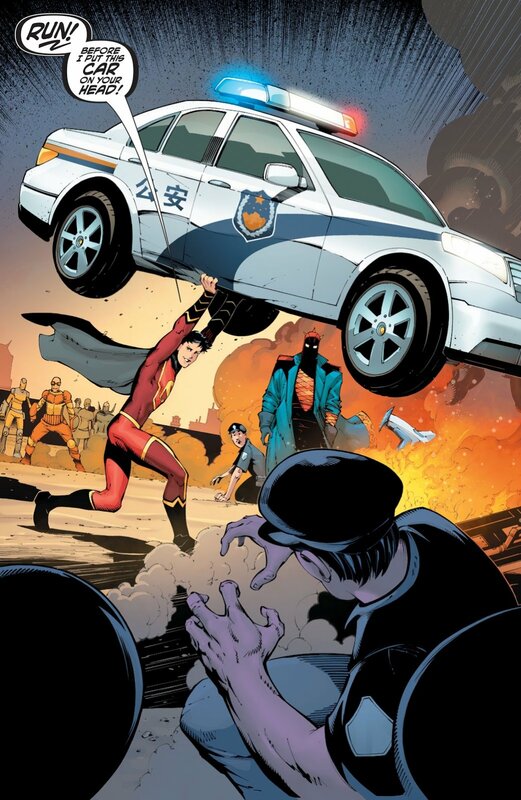 Kenan becomes a part of Ministry’s initiative to create the Justice League of China, and he’s not the only one. Beside him are Bat-man (Baixi Wang) and Wonder-Woman (Deilan Peng). At this moment Kong begins his official training because Ministry wants him to be a worthy member of The League. Oh, and we forgot to mention – Bat-Man has his own Robinbot, quite a funny lad. Of course, everything goes sideways – thanks to Kenan’s bad temper. He publicly informs Laney Lan that Justice League of China actually exists which inevitably draws a lot of attention to the country. And it also had drawn attention of Freedom Fighters of China — another Chinese superhero team fighting for truth, justice and democracy. As you may have noticed, all the characters’ names are referencing the original Justice League members: Kenan Kong – Clark Kent, Layne Lan – Louis Lane, Baixi Wang – Bruce Wayne, Deilan Peng – Diana Prince and so on. 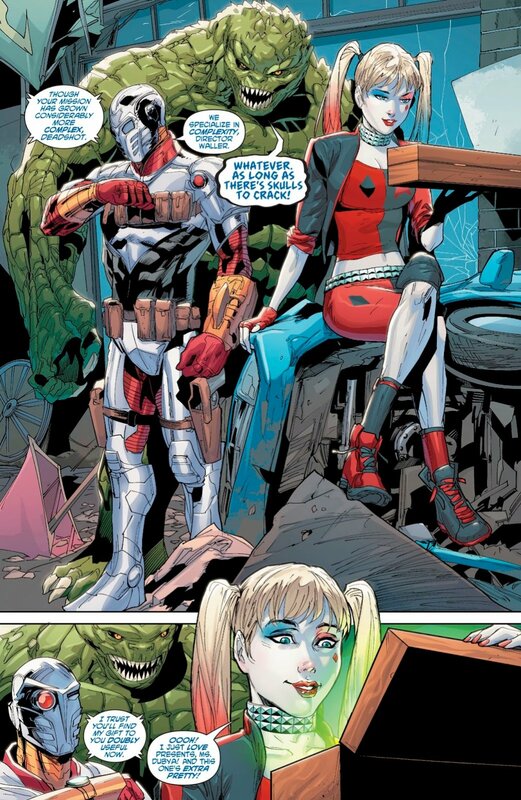 The comic is flooded with such references and it often borrows elements from the original series, but it leaves no negative impression whatsoever. The thing is that main character, Kenan Kong, is way too different from Clark Kent. Kent is a very righteous, boring, serious guy, and Kong is a stubborn teen with all the inevitable teen rebellion theme going on. Well, after all, he’s just on his way to become a superhero. 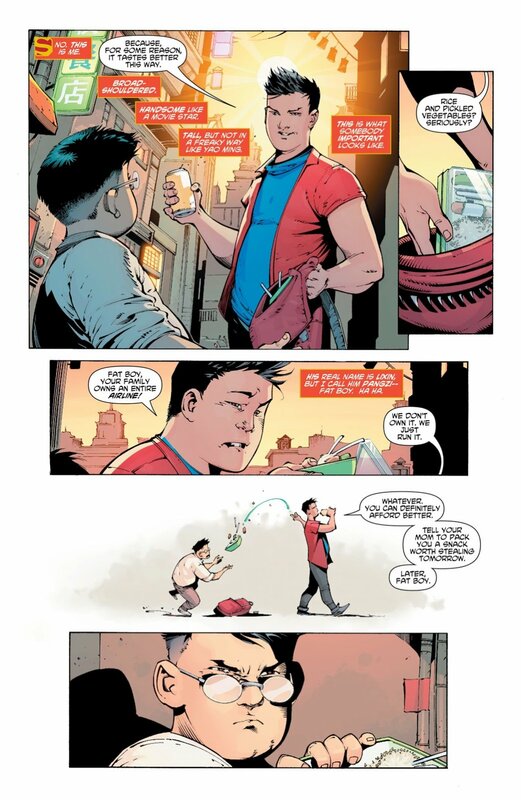 Actually, the first 20 issues of the comic are devoted to the story of Kenan’s becoming as a new Super-Man, and only then it dives into various adventures of Justice League of China. There are quite a few intriguing details in the comic itself. Even though it’s not written in Chinese for the sake of authenticity, all the English words are printed in blue, all the Korean ones in red and all the Chinese one are in plain black. Some dialogues are written in a few languages so it doesn’t feel like the whole thing is made in English. This is your typical superhero-in-training story. His simple life becomes way more complicated when the superhero part kicks in, and he has a lot of things to learn. And learning is just something that Kenan can’t stand. It leads to loads of jokes and puns. 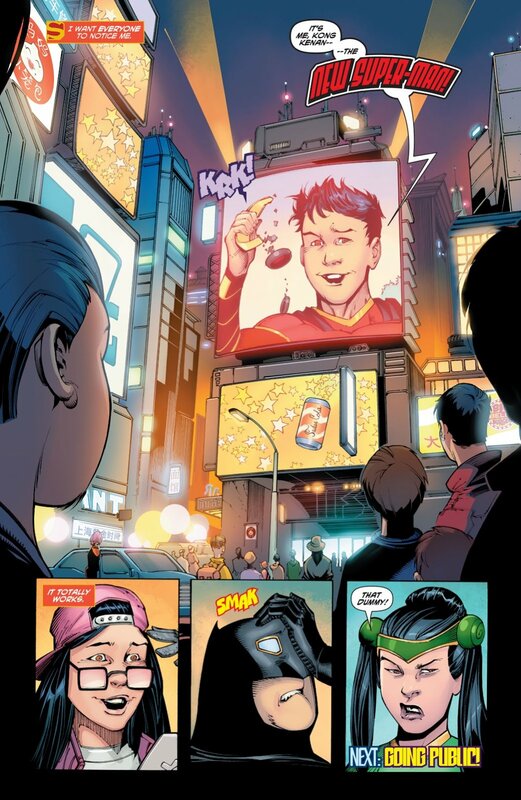 All in all New Super-Man is so full of humour and fun that it is a good read for anyone, Chinese or not. In our day and age all cultures are somewhat similar, and modern life of a Chinese guy consists of many elements well recognized by readers regardless of their origin. As we know it by now, all the superheroes and their heroic actions are similar too. 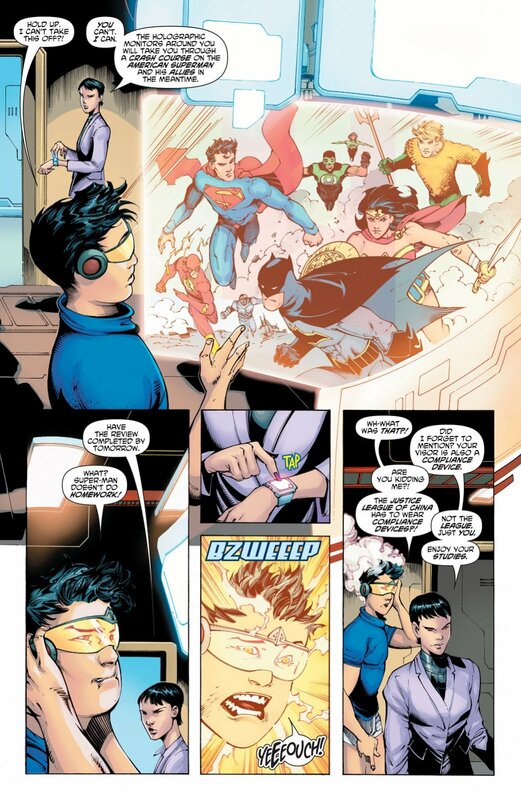 Still, New Super-Man has it’s own unique features. For example, Super-Man and Wonder-Woman rely on magic way more than it might seem. That is yet another difference between Kong and Kent – for Clark magic has always been his weak spot, but Kenan finds a way to use it. Freedom Fighters of China, especially their leader Flying Dragon General, also play important role in the comics. The Chinese Government dismisses them as criminals, but their fight is a righteous fight for democracy. 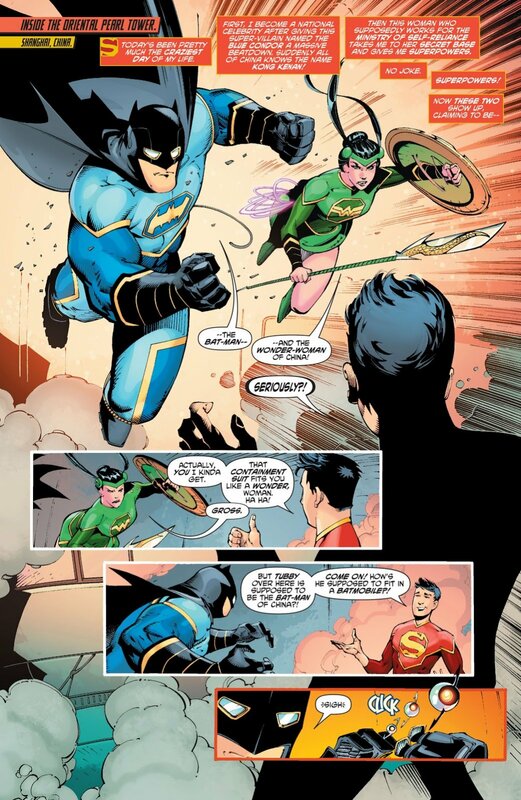 This makes young Justice League of China members to question their own actions and decide which side they are on. The main idea of the series is how long China’s been trying to create their own version of Justice League. The comic shows recent successful version of the team, but the unlucky characters from previous attempts also made their way onto the pages. 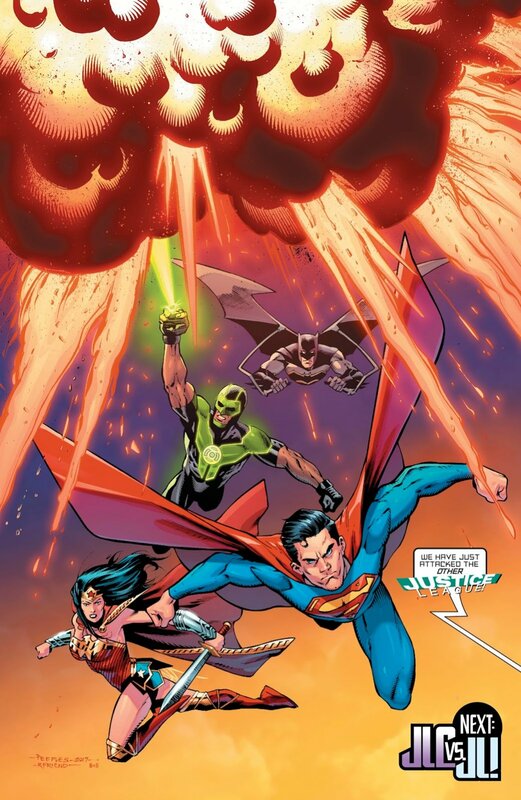 By the way, Justice League of China eventually gets their own Flash! This Scarlet Speedster is a girl named Avery Ho who lives in Metropolis. After Kenan had traveled to USA and met the original Superman, he asked Avery to join their League. 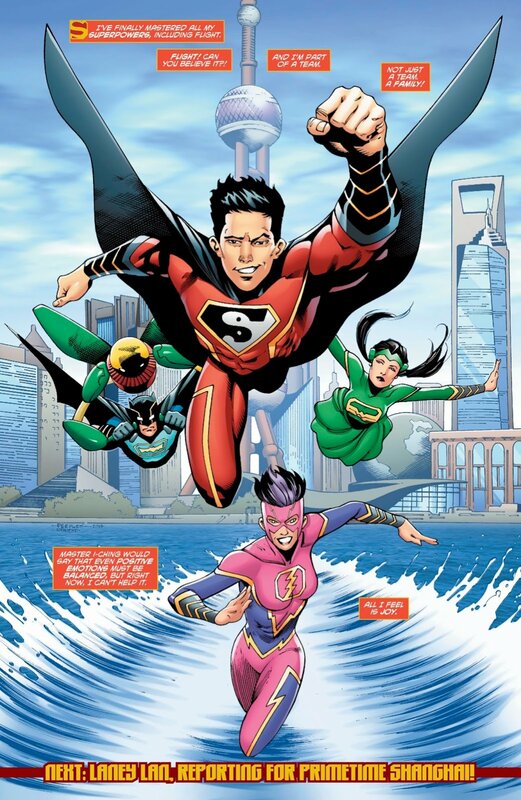 Recently the series got a new name -New Super-Man and the Justice League of China. Soon after the change the comic introduced Chinese Lantern Corps. 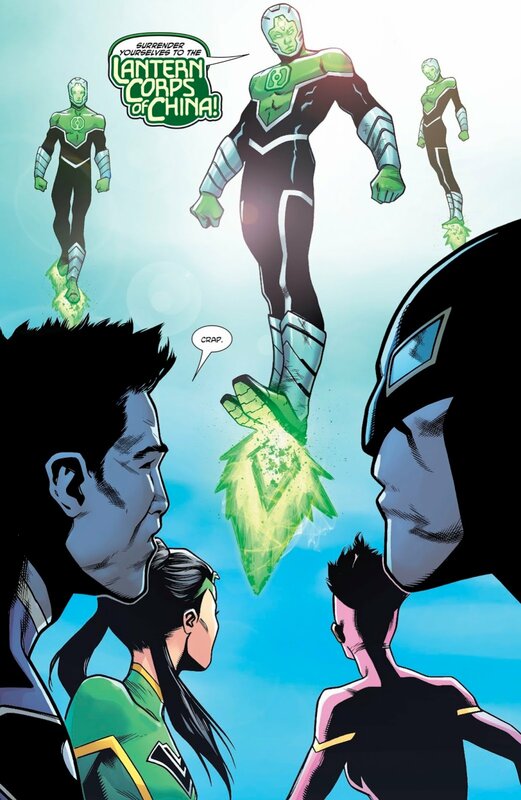 Their story is yet to be told but we know that their costumes grant the same powers as cosmic Lanterns’ rings. So, should you really give it a shot? Well, if you are tired of the typical Batman, Superman and Justice League comic books you might wanna give it a read. Superheroes are not just an American thing, right? 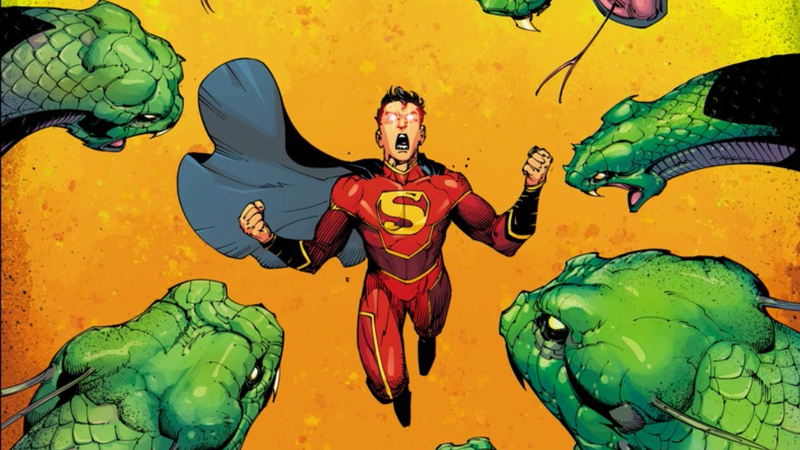 New Super-Man skillfully combines magic and modern technology, has well-rounded characters and the story that keeps on giving – and that’s what makes it a stand-alone comic rather than just a Justice League clone.